After hours of research I went into Crawfords on a wet Saturday morning to buy my first detector 10 .. This new aftermarket deluxe camouflage control box cover set has been designed specifically for the Minelab CTX 3030 metal detector. 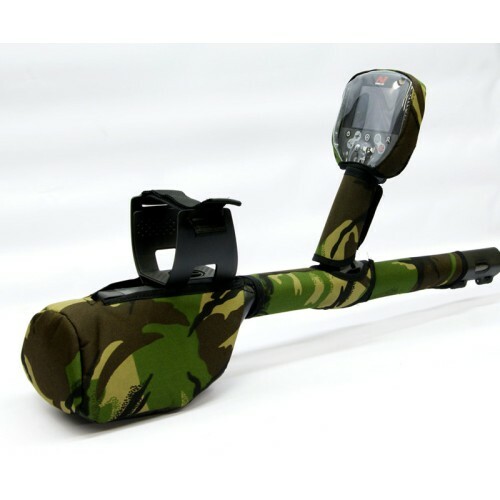 Design and camouflage colour scheme is based on feedback and demand from our customers because athough the CTX3030 is waterproof it can still be damaged, bumped, scratched and faded by sunlight etc. Due to the complex lines of the CTX 3030, the cover set is of a 5 piece modular design to cover the whole control box, screen, hand grip and upper shaft components. The advantage of this apart from the stunning neat fit is that each part can be replaced seperately if required (only complete sets are initially available). Made from a water resistant, fully padded 800 denier polyester camouflage material it has the quality and strength to protect your CTX 3030 for years to come. The base of the control box cover is extra tough PVC to withstand being stood on the ground etc.